Why, oh why, does time go so quickly? Or should I ask how? It is already that time of year when the sun crosses the celestial equator and moves south in the Northern Hemisphere...a time when the Northern and Southern Hemispheres both receive the same amount of light as they do dark...or the Autumnal Equinox...Mabon! It all falls somewhere between the 21st and the 23rd of September...but I'm never really sure of the exact moment...so these three days just sort of become an extended celebration! The beginning of my favorite time of the year. Dissolve the yeast in the warm water. Using a wooden spoon, add honey and mix well. Stir in the whole wheat flour, salt, and butter. Add in the bread flour, in ~ 3 additions…you may have to work the last bit in with your hands. Turn the dough onto a lightly floured countertop, and knead for ~10 minutes, or until dough is smooth and elastic. Form into a ball. Lightly oil a large bowl and place dough in, turning once to get a thin coat of oil all around. Cover with plastic wrap and set aside until doubled in size, ~1 hour. Punch down the dough, then turn out of the bowl. Cut in half, and place in two greased loaf pans. Allow to rise again until doubled in size. Preheat oven to 375° F and bake for ~30-35 mins., or until golden and fragrant. Immediately after you remove from the pans (while still warm), brush the tops with some melted butter, if using. Allow to cool in pan for ~10 minutes before transferring to wire rack to finish cooling. These loaves turn out soft (from the addition of the butter in the dough), studded with marigold petals, and light...with a hint of sweetness. This can be made either in a pot or in the crockpot...which is what I used this time. So easy to just put everything in and let that magical pot do its thang. Place the apples and the vanilla in a crockpot (this amount fits in a small 2 qt. pot), cover and cook on low for 4½ hrs. Lift lid and smash the apples up a bit with a fork or spoon. Add all of the seasonings. Replace lid and cook on high for another 4 hours or so...until dark and thick. Warning...your house will smell irresistible to all who pass by and get a whiff! Remove the star anise, the blend it all up with an immersion blender or in a stand up blender (carefully...it's hot!!) to get a smooth butter. Store in a sealed jar in the fridge. Place a bunch of rosemary (or thyme) into a clean glass jar. Heat some honey until it is just warm and pourable. Pour over herbs. That's it! 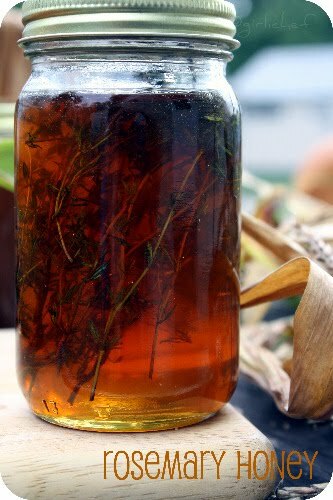 Okay, I realize that's actually a picture of the thyme honey that I labeled rosemary honey. DOH! 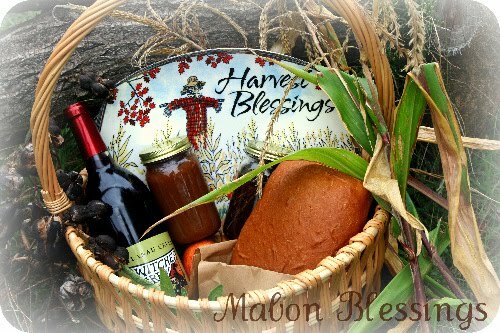 My basket to celebrate the harvest includes Marigold Honey Wheat Bread, Spiced Apple Butter, Rosemary Honey, Witches Brew spiced red wine, a bunch of sage, some apples, a squash, some seed pods and some corn stalks turning from green to brown. 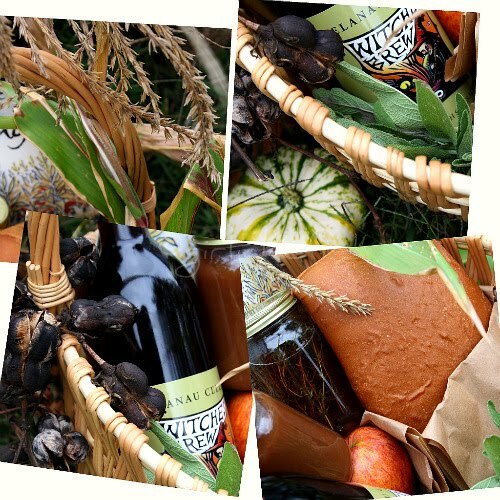 The basket itself symbolizes the gathering of the crops...the herbs, apples, squash, honey, wheat, seed pods, and corn stalks symbolize the culmination of the harvest brought in this year, and the transition to cooler temperatures and putting up the crops. Bring on the Autumn fruits and veggies...and harvest foods...and comfort meals...corn mazes...squash, gourd and pumpkin patches...apple and pear orchards...YES! Wow, now you're just showing off, hehehehe. I love the bread, yum and jam yummer. Que color más apetecible, esto se ve fantastico. ps stop by for an award! The bread looks great. The spiced apple butter and the rosemary honey look equally great. 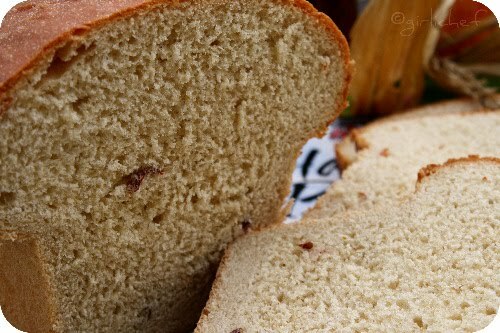 Wouldn't it be great if someone found a way that we could actually smell things like this bread over the Net. Thanks for some very nice recipes. I could totally get behind this bread for every season business. It's almost like making a sacrifice to the weather gods. Except instead of bloodshed...you get to eat it! And that rosemary honey. Man I need that in my life. Sigh...I wish I could make bread. Every time I have tried it hasn't turned out. What a PERFECT looking loaf of bread. Wow! You should see some of mine, lol. Your homemade apple butter looks lovely, I can just imagine how wonderful it tastes. And Witches Brew spiced red wine?????? I so want your basket of goodies! This entire post is just gorgeous, Heather. Truly! That bread looks really delicious! 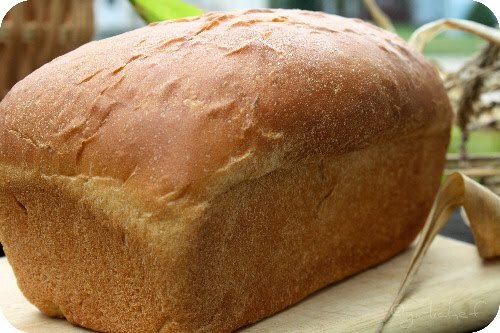 Homemade bread doesn't even compare the store bought kind. And with homemade apple butter? Slice me off a hunk! Loved this post. I make my own honey whole wheat bread but never with marigolds. I'm going to try this. I love apple butter and I always make mine in the crock pot. I'm lazy that way. I am inspired to go out and get me some apples. Yes, bring on the autumn weather! As always, the loaves look stunning. I am liking the rosemary honey too, Nice. Thank you for reminding me that it is fall. I forget, living in San Diego. Apple butter... oh yummy! You have so inspired me to make bread! Mabon Blessings to you, Heather! Your basket looks delicious. I love the meaning behind everything that you have prepared! Let the fall festivities begin! Excuse me while I wipe the drool off my face. I can almost smell that bread baking. Excellent. I love these uses of honey...you know I love autumn...can I just get jars of this from you?? Prefectly baked bread, homemade apple butter and rosemary honey looks fantabulous,thanks for sharing.. Delicious bread and jam. Yum yum!!! I'd love a basket like that! 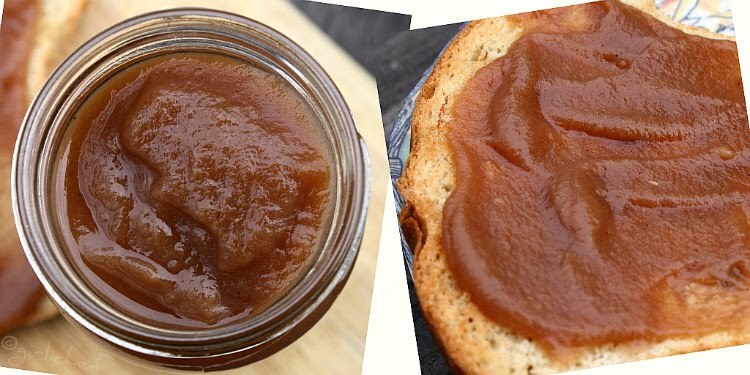 That apple butter....YUM! I will definitely be trying. Ahem...I think you have more than conquered your fear of yeast...you have a winner of a loaf there!! Beautiful bread, I love the apple butter too, and the rosemary honey is a wonderful idea--my rosemary is going off so I need to make some. Great post! I'm impressed with that bread. Beautiful bread. Brilliant idea for the rosemary honey. And I love the sound of your apple butter, Heather!! This just made me feel all warm and cozy inside! I can picture you sitting under a tree sipping on your witches brew and munching on homemade bread while colorful leaves fall around you. What a gorgeous sight! This is the most splendid way to usher in autumn - also my favorite season. The bread, the honey... and that sweet apple butter all tempt and charm. here from Roz site, gorgeous just gorgeous! I'm loving everything, but would really love to slather some apple butter on that bread right now. P.S. Just got jam it, pickle it, cure it from the library. You were so right. I want to make everything! Just lovely! I've bookmarked this page so I can make both your lovely bread and that delicious apple butter! You have a beautiful blog, and I'm very glad I found it! I just found your blog from Fresh, clean and pure Friday blog hop and I am now following you. Lovely. 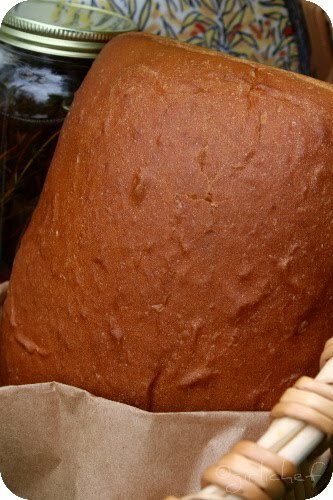 Wow, both the bread and the apple butter are absobloominglutely beautiful! Wow... is all I can say...so very creative. You are such a talented bread baker! I am always amazed! 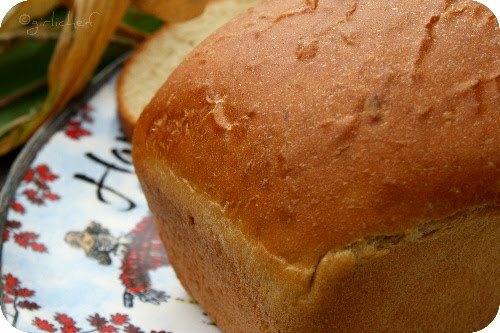 And I think baking bread is the perfect Autumn and winter activity. Beautiful photos! Your bread looks amazing! Just the title had me drooling. The rosemary honey sounds so different and delicious. The apple butter brings back my memories of college in Pennsylvania.There was apple butter at every meal! LOL! I've been hosting a weekly meme called Seasonal SUNDAYS and it's all about what the season means to YOU. I'd love to have you come join me. The link goes up in the early hours of Sunday, so link at your leisure any time on Sunday or Monday. Hope to see you then. Thanks for bing a part of Seasonal Sundays. Hope to see you next week! It looks delicious and I bet it smells heavenly!